For such a small camera, the EOS M5 handles remarkably well. There’s not a lot of room on the top plate, but Canon has still found room for a good-sized mode dial on the left, two control dials on the right and a separate EV compensation dial. One of the control dials is for customisable camera functions. You press the central button repeatedly to choose the function, then turn the dial to change the setting. It works really well, but initially only two functions are assigned to it, and you have to dig pretty deep in the custom settings menu to find out how to add more. If you don’t know where to find a particular shooting setting, chances are it’s on the camera’s Q Set screen, which displays a row of settings icons down the left and right of the screen. The memory card and battery sit next to one another under a door on the base of the camera – a bit of a nuisance when you’re changing cards, but a common compromise in small camera bodies. The lens retraction button on the 14-45mm kit lens is fairly flush with the lens barrel and a little fiddly to operate. This lens has a plastic rear-mounting plate: this isn’t unusual on low-cost kit lenses, but it’s disappointing to find the more expensive 18-150mm kit lens option also has a plastic mount. The fact is that both these lenses feel a little cheap. They’re not especially fast, either, since both have a maximum aperture at full zoom of just f/6.3. The M5’s touchscreen focus works well, but if you use the viewfinder and the touch-focus feature on the main screen at the same time, it’s all too easy to touch the screen accidentally with your nose and focus on something you didn’t mean to. 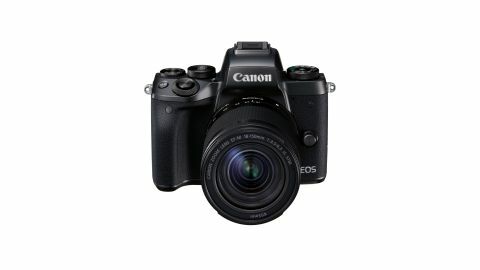 This is such a small camera that it’s hard to believe it has an APS-C sensor. You can get really attractive background blur at wide apertures. While Canon’s Dual Pixel autofocus is better than regular contrast autofocus, it seemed to hunt and fail sometimes in poor light situations, where we’d expect an EOS SLR to focus without any trouble. In good light the autofocus works fine. With the 15-45mm STM kit lens, it felt almost but not quite as snappy as a mid-range EOS SLR – and that’s not bad in a camera squashed down to almost half the size. The image results are very good, although the response of the Evaluative exposure metering system proved hard to predict. Very bright subjects led it to under-expose now and again, so we had to dial in some positive exposure compensation to restore brightness to the scene. The high-ISO image quality is good, although it falls off past ISO 6,400. Exposure accuracy was really good on the whole, although now and again, a high-contrast subject fooled the M5 into heavy underexposure. The dynamic range proved good but not exceptional in both our lab and real-world tests. Bright, overcast skies could be an issue, for example, as the camera tends to cut off the brightest areas fairly abruptly. At ISO 1,600, the EOS M5’s images look crisp, colourful and relatively noise-free at this setting. They’re a little noisier and softer at ISO 3,200, and more so at ISO 6,400 – which is probably about as far as you’d want to go. The results at ISO 12,800 are still OK, but at the maximum setting of 25,600, the combined effect of noise, smoothing and general softness is pretty excessive.